Product Size: 36 x 18 x 48” approx. Mandir has its own significance in the lives of each and every Hindu. Aarsun Wood manufacture and supply exceptional quality statues of Wooden Temple an incarnation of Mother Goddess.The elegant and wooden temple offered by us are carved out by expert artisans who have vast knowledge and experience in this field.This Hand carved Temple made from Seasoned Sheesham Wood.We are known as the premium designers of Wooden Temple for home which is an example of the perfect artistry of our creative artisans. The temple has ample space for placing the Idols and the temple consists of a Dome with Om at the top, Designer doors in front, Slider tray for placing Diya and a lid style open space at the bottom for keeping Pooja Essentials. 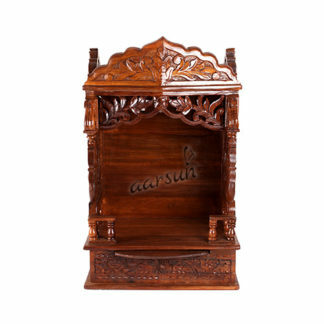 These are not just perfect to be established in your house but can be accommodated easily in offices also due to their availability in different shapes and sizes.We provide a wide range of designs in Wooden Temples that can be customized as per your requirement. Contact us for a different Size as per your requirement.